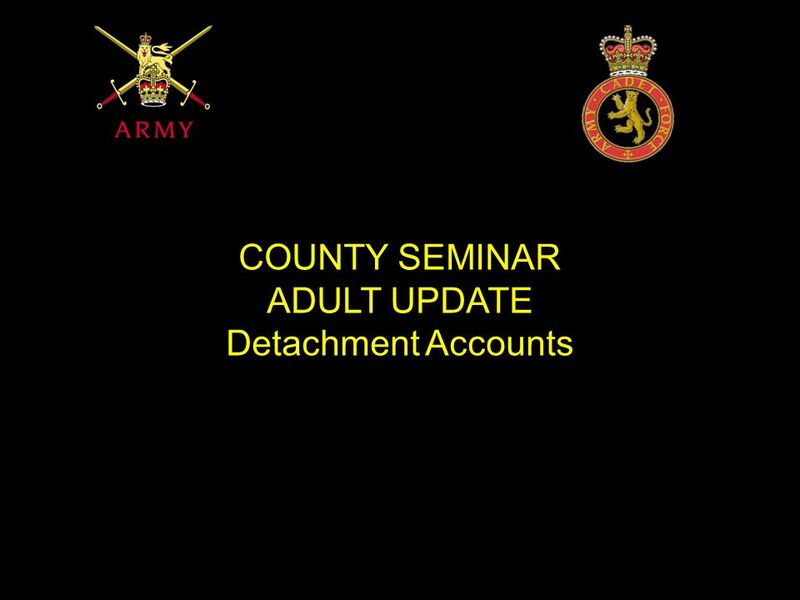 9 Adults: Volunteers …. 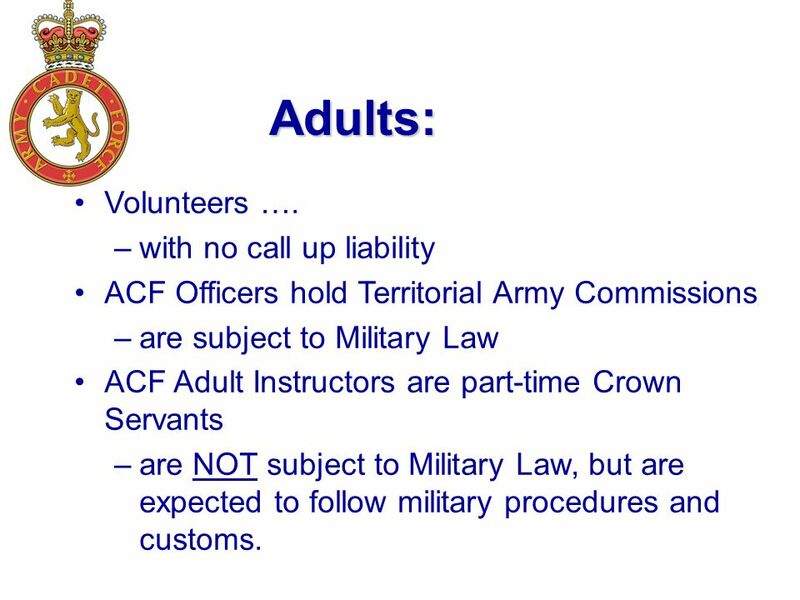 –with no call up liability ACF Officers hold Territorial Army Commissions –are subject to Military Law ACF Adult Instructors are part-time Crown Servants –are NOT subject to Military Law, but are expected to follow military procedures and customs. 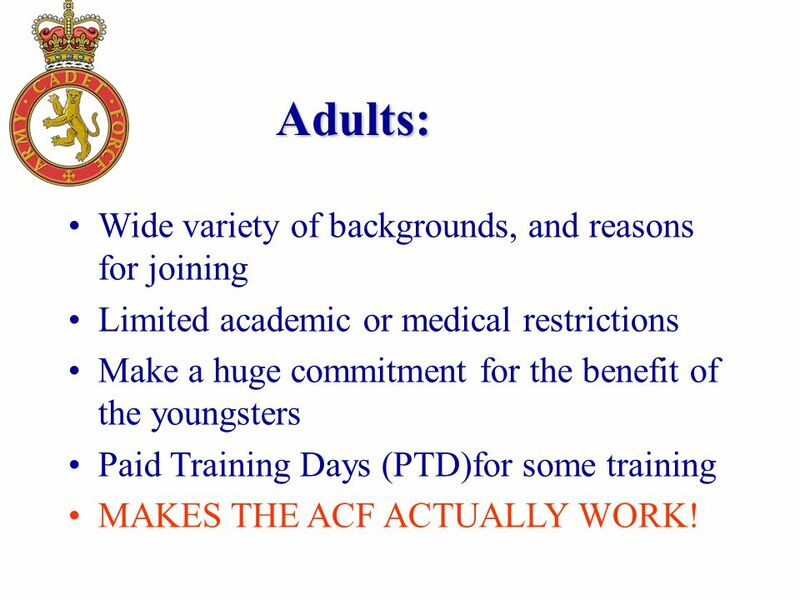 10 Adults: Wide variety of backgrounds, and reasons for joining Limited academic or medical restrictions Make a huge commitment for the benefit of the youngsters Paid Training Days (PTD)for some training MAKES THE ACF ACTUALLY WORK! 12 What is the problem? 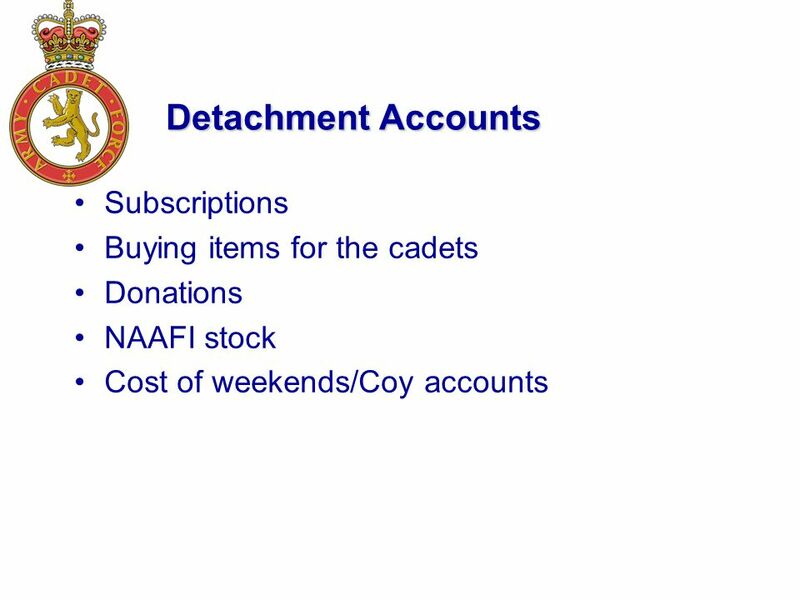 Problem 1 General points: Detachment between 40 and 70 cadets. 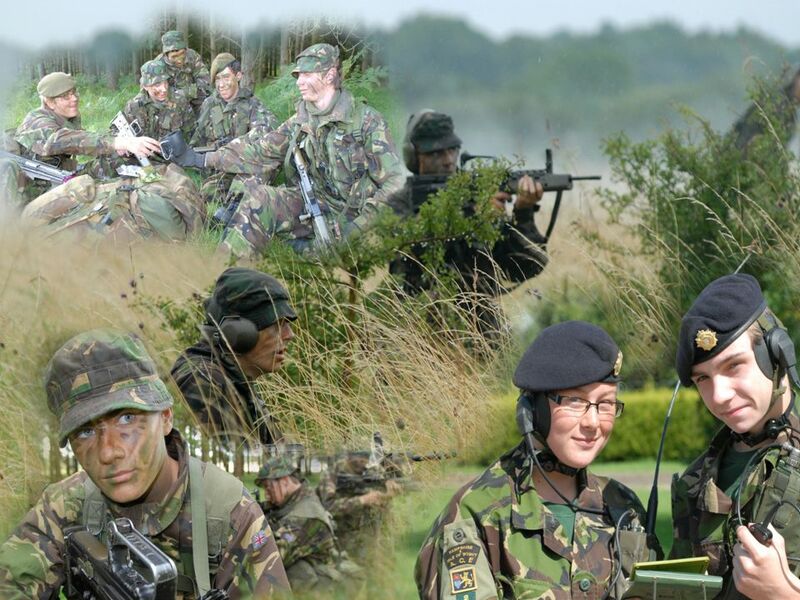 Cadet NCO's 1 Colour Serjeant, 3 Serjeants, 3 Corporals and I think 5 Lance Corporals. 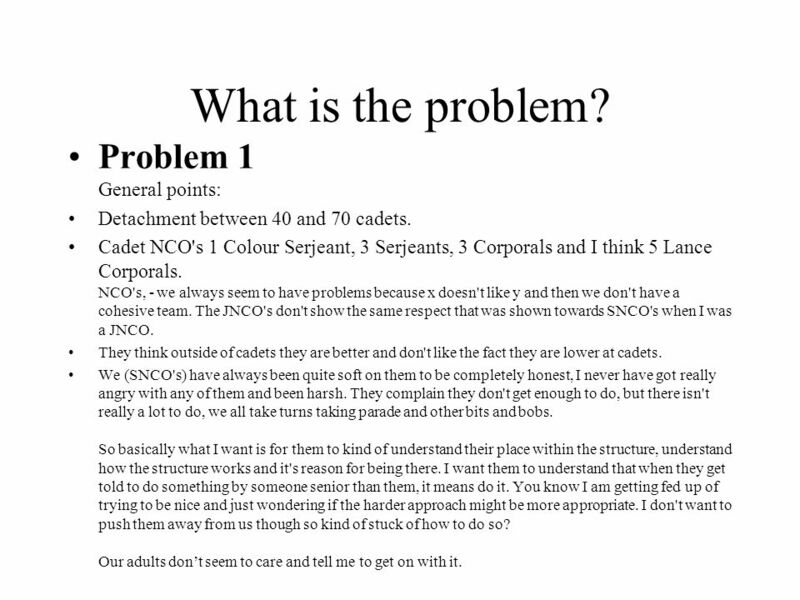 NCO's, - we always seem to have problems because x doesn't like y and then we don't have a cohesive team. 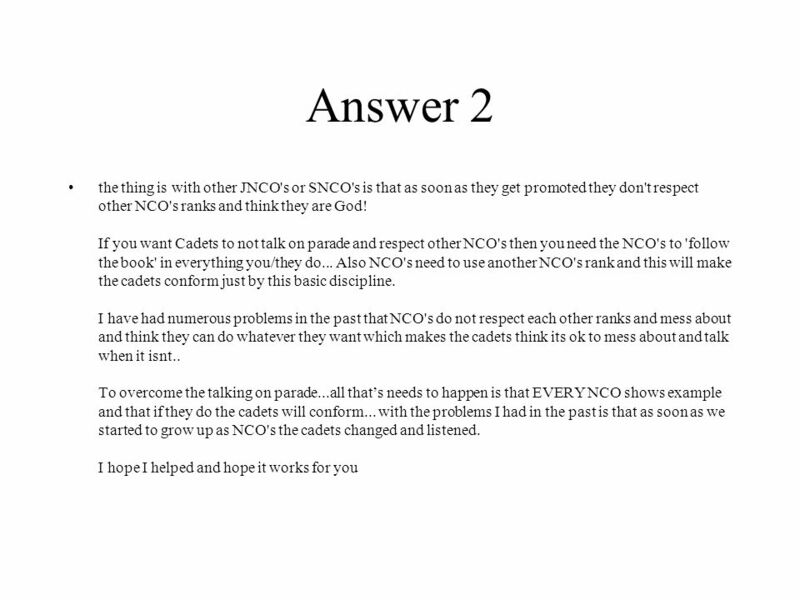 The JNCO's don't show the same respect that was shown towards SNCO's when I was a JNCO. 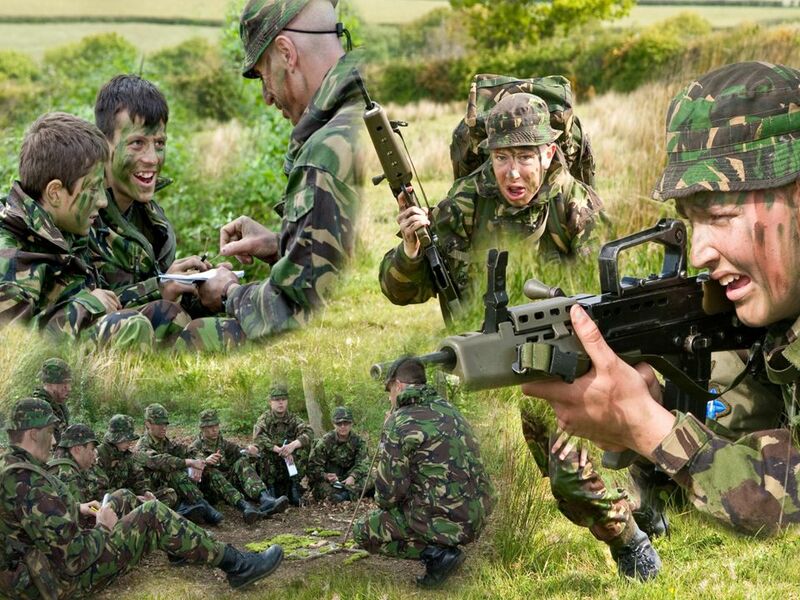 They think outside of cadets they are better and don't like the fact they are lower at cadets. 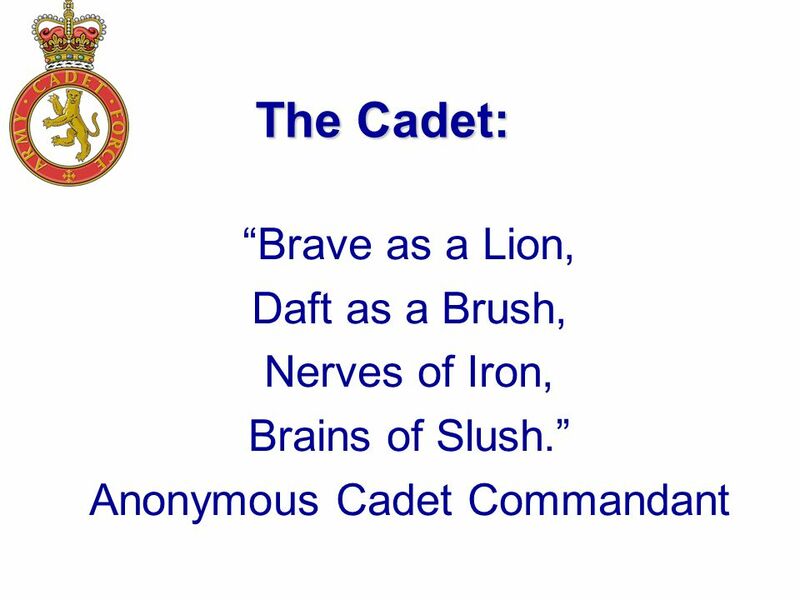 We (SNCO's) have always been quite soft on them to be completely honest, I never have got really angry with any of them and been harsh. 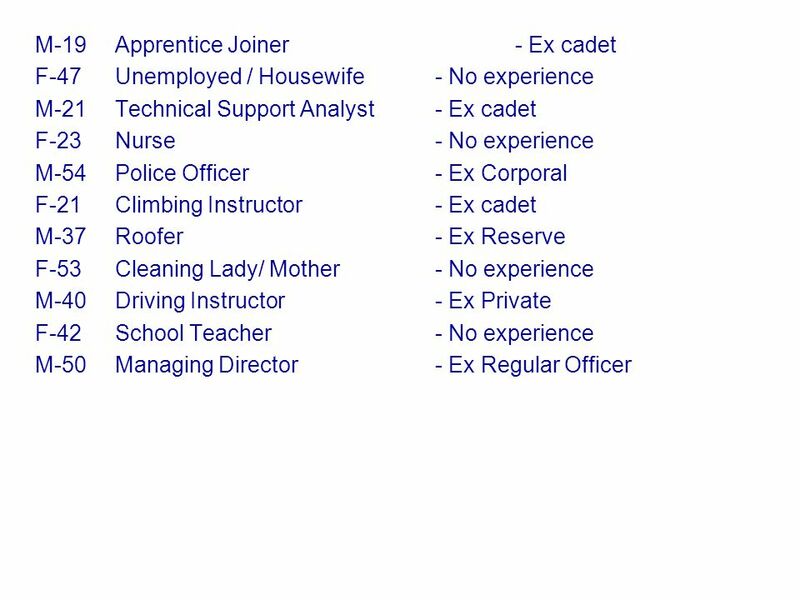 They complain they don't get enough to do, but there isn't really a lot to do, we all take turns taking parade and other bits and bobs. So basically what I want is for them to kind of understand their place within the structure, understand how the structure works and it's reason for being there. I want them to understand that when they get told to do something by someone senior than them, it means do it. You know I am getting fed up of trying to be nice and just wondering if the harder approach might be more appropriate. I don't want to push them away from us though so kind of stuck of how to do so? Our adults don’t seem to care and tell me to get on with it. 13 Answer??? 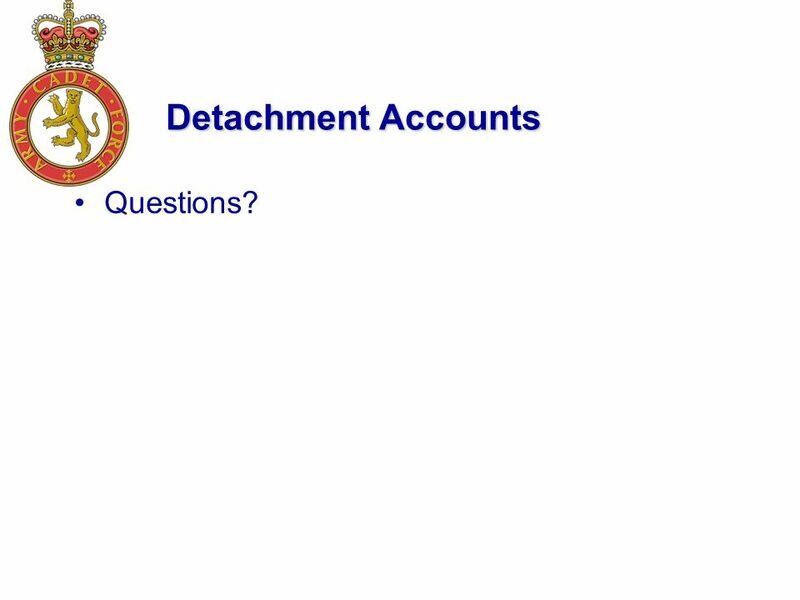 So the detachment discipline isn't that great, there biggest problem is the talking on parade, it ends up someone having to shout to get them quiet. 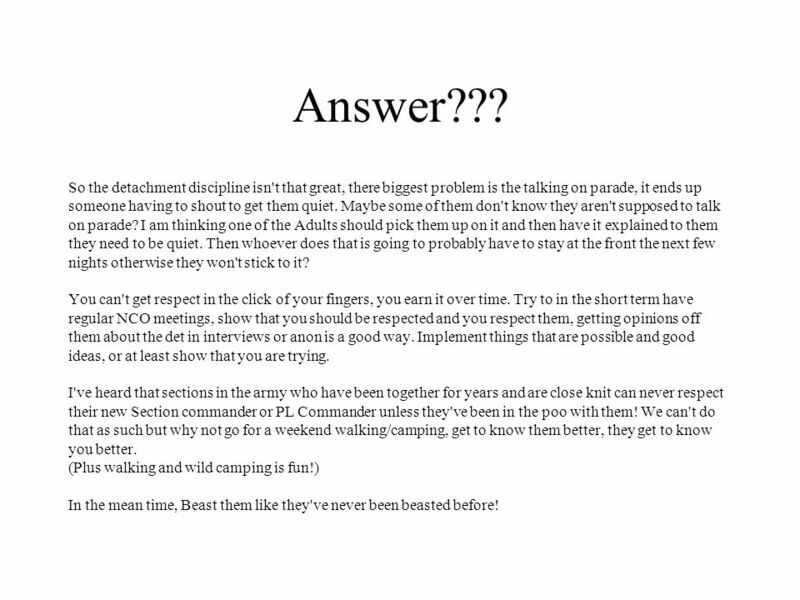 Maybe some of them don't know they aren't supposed to talk on parade? I am thinking one of the Adults should pick them up on it and then have it explained to them they need to be quiet. Then whoever does that is going to probably have to stay at the front the next few nights otherwise they won't stick to it? You can't get respect in the click of your fingers, you earn it over time. 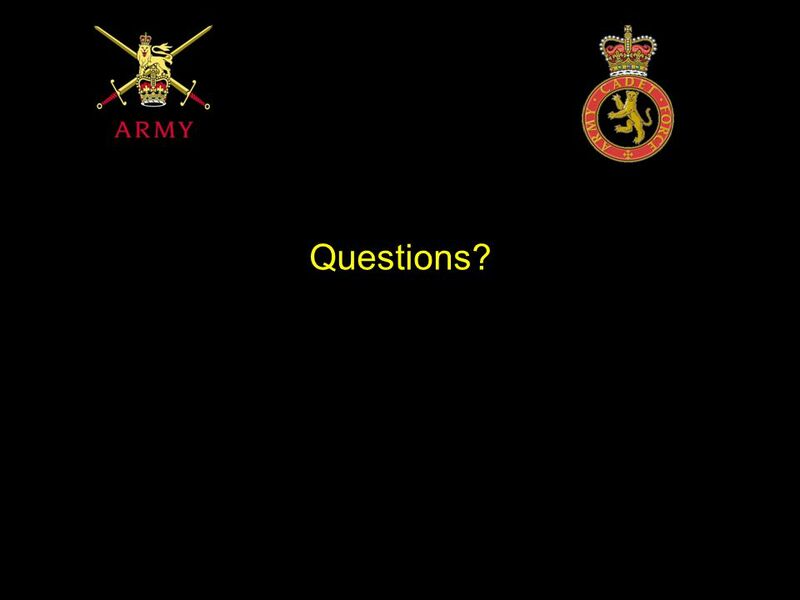 Try to in the short term have regular NCO meetings, show that you should be respected and you respect them, getting opinions off them about the det in interviews or anon is a good way. Implement things that are possible and good ideas, or at least show that you are trying. 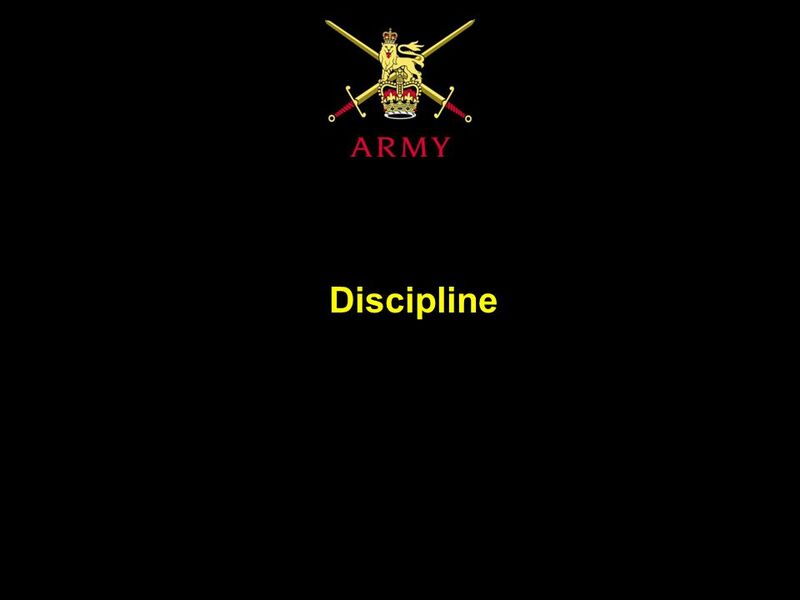 I've heard that sections in the army who have been together for years and are close knit can never respect their new Section commander or PL Commander unless they've been in the poo with them! 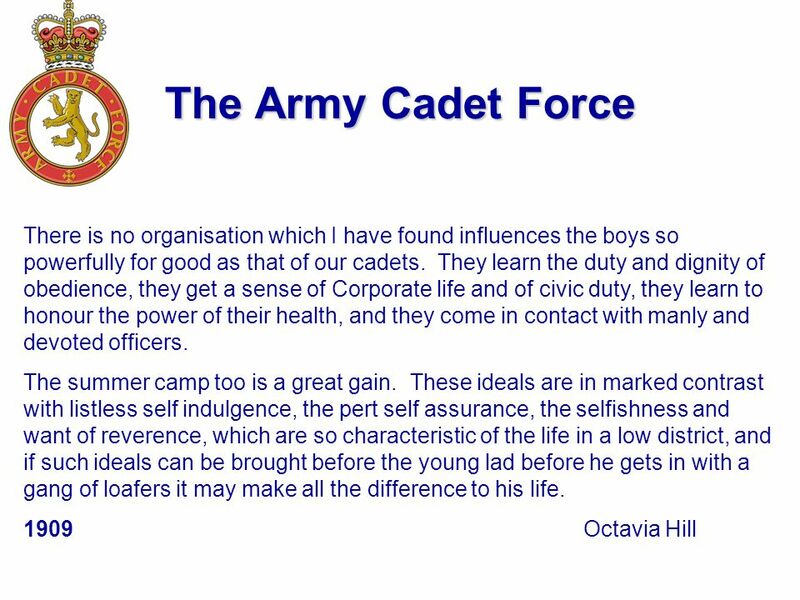 We can't do that as such but why not go for a weekend walking/camping, get to know them better, they get to know you better. 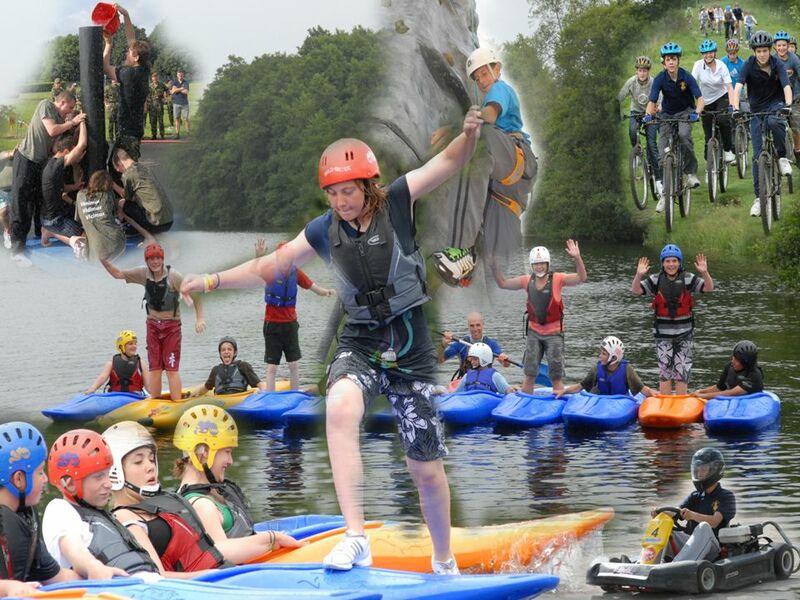 (Plus walking and wild camping is fun!) In the mean time, Beast them like they've never been beasted before! 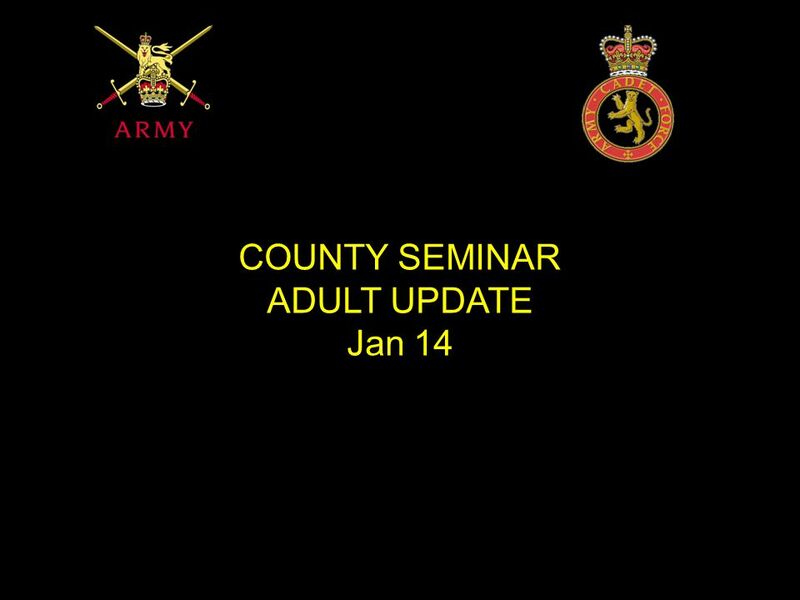 Download ppt "COUNTY SEMINAR ADULT UPDATE Jan 14. 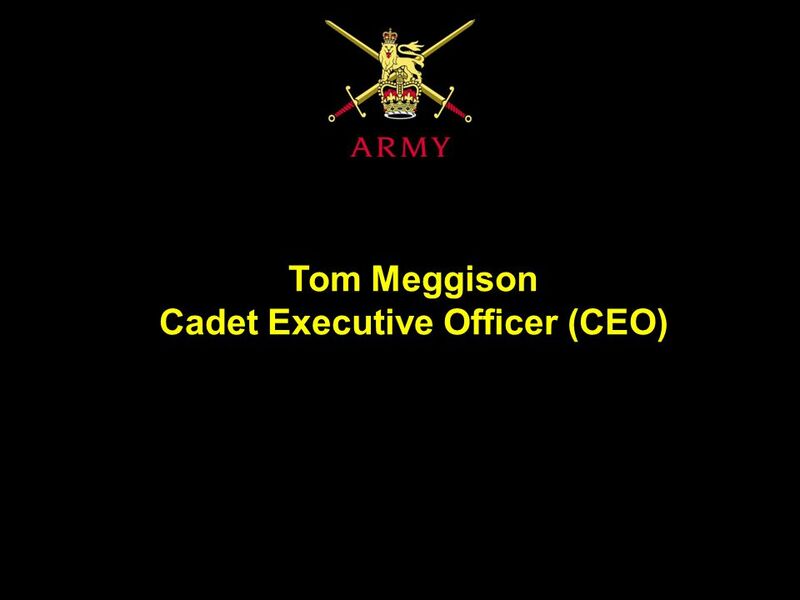 Tom Meggison Cadet Executive Officer (CEO)"
Attention (your target market) !. Are you (their problem) ? Finding a home for old computers What do most people do with their old computers? What kind of homes do you think the passage will suggest for old computers? What people in my school and community think about the police and what they do: a small-scale study Christopher Orme age 10. All the layers to YOUR citizenship! I wonder what a CITIZEN is? The basics of ratio. 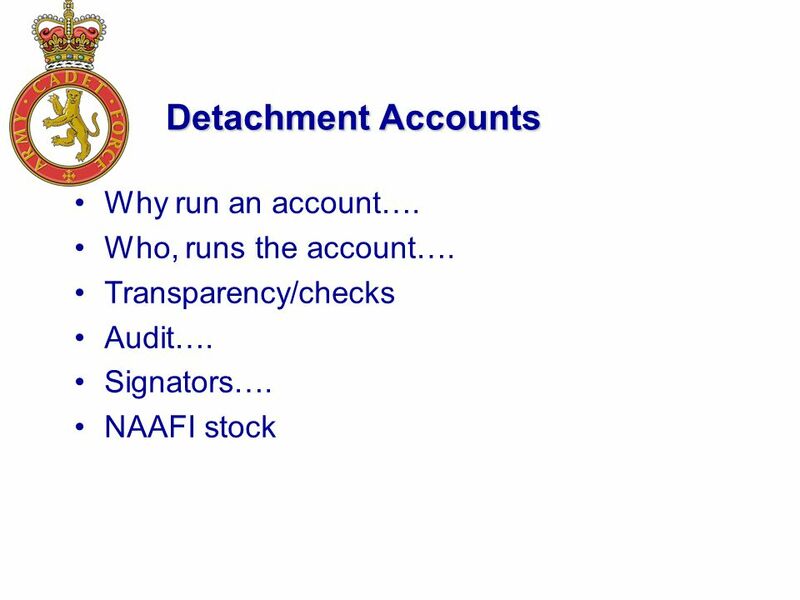 The purpose of this staff tutorial is to introduce the basic ideas of ratio and to show how ratio relates to fractions. Using this. ECEU300 Ethics in the Workplace Why talk about Ethics? Everyone is ethical, everyone knows how to behave at work. Everyone gets it about not stealing stuff. My Career interests… By Mac Cohen. Reflect Interesting subjects: Entrepreneurship- I’m in control, rely on myself, I do what I want Meteorology: Clouds.